Tombola is a lottery platform that draws on a blockchain basis. Users can purchase tickets through virtual currency and proceed with the game, and the prizes are automatically distributed according to the winnings. One will be able to freely use the value obtained through purchase or winning by using various game services and distribution system, which provides users with an opportunity to increase their value. Tombola is a lottery and gambling service that operates on the EOS blockchain. The platform is impossible to manipulate, making it safe for all participants. On the platform, users can find clear information on all the tickets bought, lottery numbers involved, and winners. All their game services operate on the blockchain, meaning that no one can manipulate the results of the game. Contrary to the Ethereum platform, Tombola requires no fees because the platform is under EOS blockchain. In the absence of fees, the platform attracts many participants. The platform plans to give half of all its profits earned on all lottery and gambling games to its token holders. Besides, the Tombola game is fair because it generates a hash value with seeds. 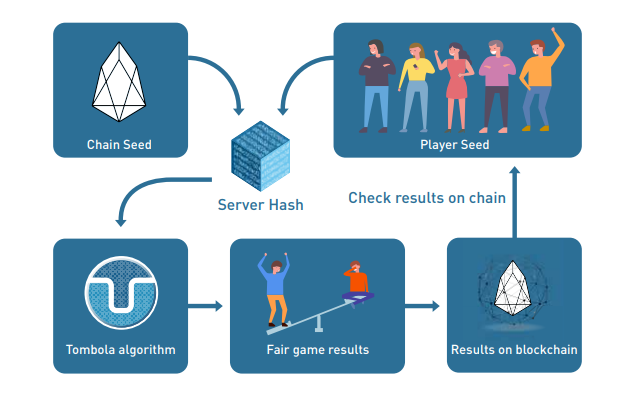 The platform randomly generates seeds in the EOS chain and together with the seeds in the platform. The hash value it generates utilizes the Tombola algorithm to arrive at the results of the game. Importantly, all the results are recorded on the blockchain. The platform accepts both BTC and ETH. It also offers TBL token betting with no fees charged. The platform allocates 50% of its revenue from the Tombola game to TBL token holders. Besides, it also allocates 10% of the TBL lottery to the token holders. Presently, the lottery industry has grown into one of the largest sectors in the world. The online lottery industry commands a significant share of the market every year. With the Tombola platform, users can now utilize the world’s public currency to challenge the world’s greatest prize money. Briefly, Tombola offers various games including Black and White, Turtle Chase, Dice 3, and 5/20 speed lotto. It uses airdrops and bounty programs in all its marketing activities. The Tombola Black and White game is a concept of instant lottery. It’s somehow a selection game in which a player selects one of the two camps of Black and White. The user has to set a victory camp with a 50 percent chance for each turn. Camp selection must happen within the turnaround time. The Turtle Chase game involves three turtles that have to choose one among them to bet in a fascinating race. Users can make a bet by selecting among the red, blue, and green turtles, which must happen within the preparation time. In the Dice 3 game, users predict and match the result of the three dice in advance. The game allows the users to set the catch value and to select upside down. In a blockchain, a ‘block’ is a ledger where personal data and personal transaction (P2P) data are recorded. After these blocks are formed, they have a structure of ‘chain’ sequentially connected over time. Every user has a transaction history, so when verifying transaction details, you should check and verify the ledgers held by all users. For this reason, the blockchain is also referred to as a“public transaction ledger” or “distributed transaction ledger”. however, it is difficult to forge or alter data because many people store the same data. If you try to forge or alter them, it is virtually impossible because you have to forge or alter all the data of the innumerable people. Smart contract is a computer protocol designed to digitally propagate, verify, or enforce contracts. Smart contracts allow for trusted transactions without third parties, which are traceable and irreversible. The purpose of smart contracts is to provide a secure method that is superior to traditional contracts and to reduce other transaction costs associated with contracts. Based on the above-mentioned blockchain and smart contract, all actions performed on Tombola platform, such as the number of tickets selected by all users, the time of purchase of the tickets, the winning numbers, the number of winners, and the winners are impossible to forge or alter. In addition, it can be transparently shared by all users, which completely compensates for the risks inherent in the existing lottery services, making it possible for users to use Tombola without worry on the basis of such reliability. Tombola Black and White, a concept of instant lottery, is a kind of camp selection game. This is a game where one of the two camps of Black and White is selected; setting a victory camp with a 50% chance for each turn, the user must select a camp within the turnaround time.